PALMA DE MALLORCA, Spain - May 1, 2018 - PRLog -- The world's leading vegan cooking academy and training services company, Vegan Gastronomy Culinary Academy, announced today that it has commenced a global education program to teach cooks and chefs how to simply and cost effectively replace eggs used in common dishes around the world with a plant based vegan product called Potato Protein. "We finally decided we could not sit and just watch people around the world constantly subjecting themselves to the risks of eating eggs," commented Manuel Lynch, Founder of Vegan Gastronomy Culinary Academy. "The use of eggs has been part of culinary tradition for centuries but there reaches a point where innovation lets us move past the problems into a modern way of eating and living." Vegan Potato Protein is simply the protein of a potato that has been isolated, extracted and turned into a fine powder. Potato Protein can be used to replace eggs in Mayonnaise, Meringue, baked dishes, quiche, macarons, and even souffle, to name a few. The Global Education Program involves the academy trainers spending only 15 minutes with cooks and chefs to show them how to work with the product. Key features include how simple and reliable the product is and how it can extend the life of prepared foods. "As new food safety laws put more demands on kitchens and restaurants to protect against potential deadly salmonella outbreaks, prepared egg dishes have a very short life," continued Lynch. "Potato Protein allows kitchens and restaurants to prepare classics like mayonnaise and store them for weeks without potential adverse health risks." During the free training program that the academy offers, cooks and chefs learn that Potato Protein is actually a higher and more complete protein than eggs, and is also lower cost than eggs. 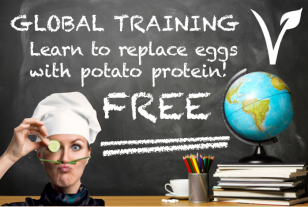 For more information see www.VeganPotatoProtein.com and request a private in person or private online LIVE training workshop.